The start of the Major League Baseball season is still several months away but sportsbooks have already posted futures odds on the 2019 World Series Champion. Compounding the difficulty of setting an early line is the free agent market—a number of superstar free agents remain unsigned. While this is true to some degree every year the market for high dollar veteran players has crashed. Teams are very comfortable about using young prospects in their starting lineup and thus the demand for proven veterans isn’t what it used to be. The 2019 free agent class is as deep as any in recent memory but that’s more due to a weakness on the ‘demand’ side than anything else. No matter what position you look at there are big names still available starting with some of the top stars in the sport including Bryce Harper, Manny Machado, Craig Kimbrel and Dallas Keuchel. The market has been so tepid that some players have suggested that some sort of collusion must be taking place. Others have taken aim at advanced statistical metrics which they claim has upended the ‘star system’ that existed for so many years. There is definitely truth to this but the players claim that ‘fans show up to see stars’ is a dubious one. More specifically, fans show up to see winning teams. In the past there was a direct correlation between having high profile stars on a team and their ability to win games. Now that this has been decoupled teams are learning that they can achieve equal or better results without paying bloated salaries to aging players. The market has definitely change but its a result of evolution and organic forces and not the ‘fault’ of anyone. This reality does make setting a futures line for the World Series very problematic. Teams might be ‘waiting out the market’ and hoping to lure a big name player at a discounted price. Meanwhile, players might have a greater motivation to sign with their previous team than in most seasons. No matter the reason, a team’s roster at the time of this writing (1/29/19) and opening day will almost certainly experience significant changes. Even with the uncertain roster situation there’s no real surprise that the defending MLB champion Boston Red Sox are co-favorites along with the Houston Astros and the New York Yankees. All three teams are at +600 and are coming off very impressive seasons. 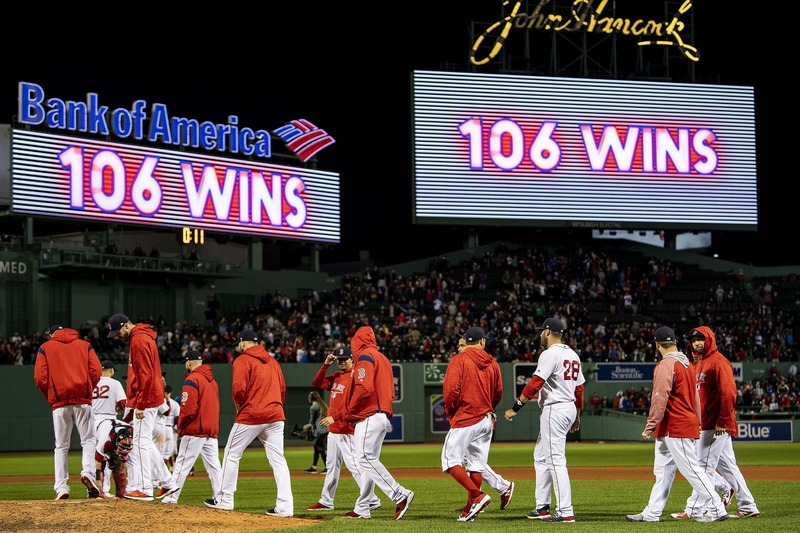 The Red Sox not only won the World Series but won 108 games in the regular season to finish with the best record in baseball. The New York Yankees finished eight games behind the Sox in the AL East but with a record of 100-62 outperformed every team in the National League. The Houston Astros won the AL West and in the process were victorious in 103 games. The only other team priced at single digits is the highest ranked National League team, the Los Angeles Dodgers at +700. The Dodgers were the losing team in the 2018 World Series. There’s a logjam of teams between +1000 and +2500 including the Chicago Cubs (+1100), Atlanta Braves (+1200), Philadelphia Phillies (+1300), Cleveland Indians (+1600), Milwaukee Brewers (+1600), New York Mets (+1600), St. Louis Cardinals (+1600), Washington Nationals (+1800) and Oakland Athletics (+2500). The Colorado Rockies are at +2800 with the Arizona Diamondbacks and Tampa Bay Rays both at +4000. No other MLB team is priced at odds lower than 50 to 1. At the other end of the spectrum the biggest longshot is the Baltimore Orioles (+25000) followed by the Miami Marlins (+20000), Kansas City Royals (+20000), Detroit Tigers (+15000), Texas Rangers (+12500) and San Diego Padres (+12500).